If you wish to travel to Santorini, you may access the island either by plane from Eleftherios Venizelos Athens airport with a flight duration of about 50 minutes or by boat that it will take you up to 9 hours. From the ports of Piraeus and Rafina, it will take you 9 hours to get to this amazing island by the plain boat or about 5 hours with the high speed boat. You will find that moving around in Santorini is really easy even if you haven’t rented your own car, you will see for your own that the frequent local bus system is offering every traveler access to all the villages. Departing from Fira the local bus will take you only to the most exciting villages of the island, even if they are to the other side of the island in the case that you wish to discover for yourself what an amazing island Santorini really is. Alternatively there are means of transportation like taxis all over the island that you can book by telephone and could take you to your desired point or pick you up from anywhere you wish. 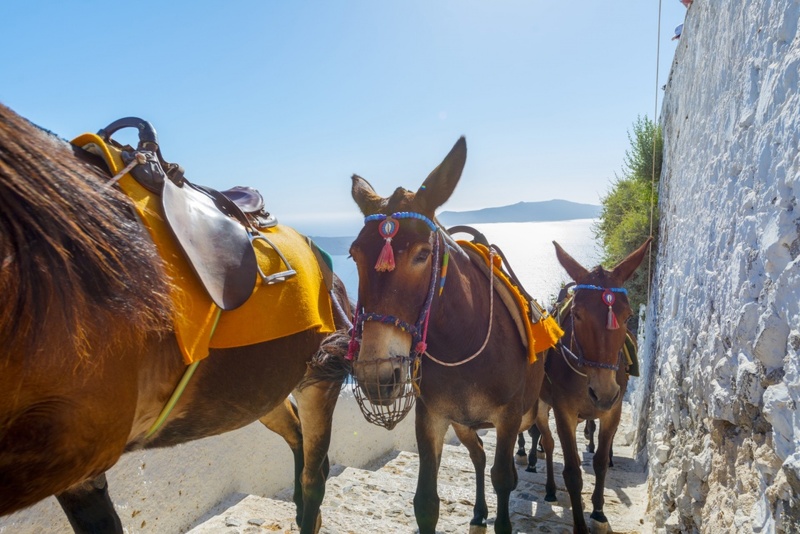 An other way to move around the island is the old fashioned way - really greek and more importantly utterly amusing- with donkeys, a traditional but yet so amazing way to reach your destination and not having to worry about how much you pay as it is a standard cost for this. However an important option to consider is renting a car for your stay as you have several big-name companies as well as local ones that will offer you perfectly preserved previously owned cars to move around without worrying too much about how to get to one or the other place. Be aware that when driving in Santorini there will be some areas that you will not be allowed to park your car and more importantly that you do not get behind the wheel once you had a few drinks as driving safely is the most important of all.